I am new to beading. This does not give enough details to make something. This does not say how many times to repeat the above pattern. How long? How many beads? I’m new to this kind of beading. 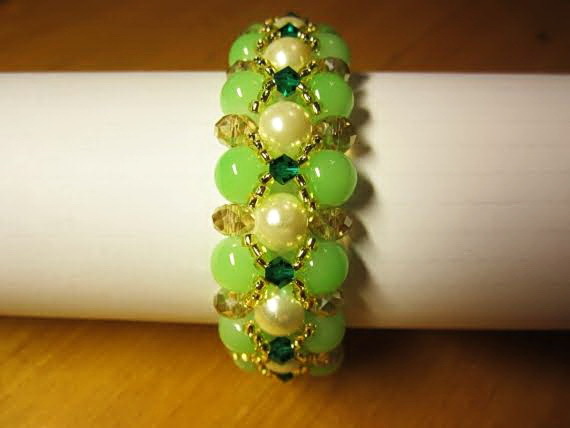 This bracelet would be !beautiful in Christmas colors. I wonder what to use as thread? 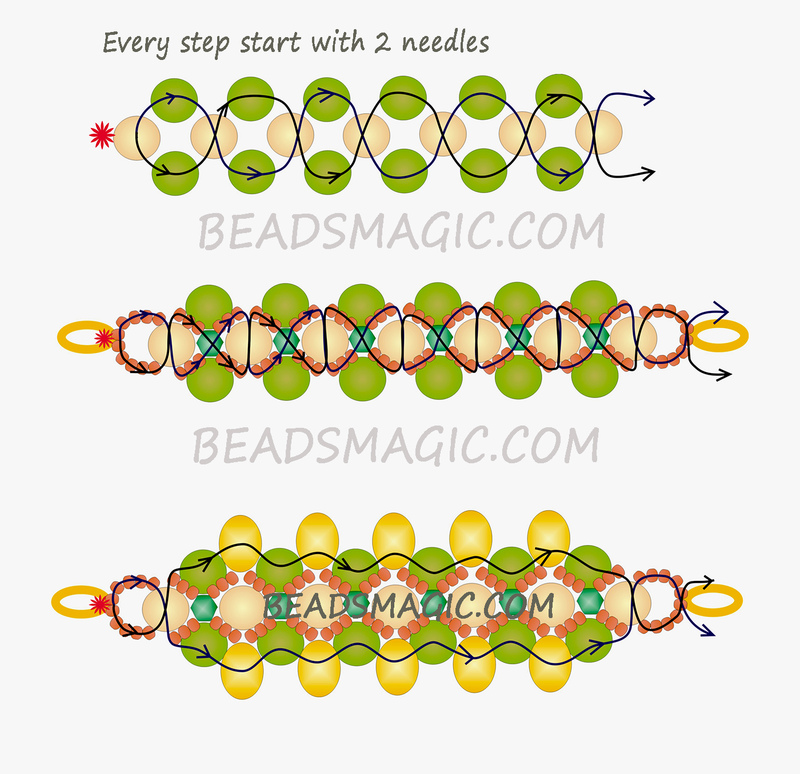 This is a Pictorial patten if you look at the photo diagrams it shows you EXACTLY how many beads to use of each type and the direction of the thread pathway. 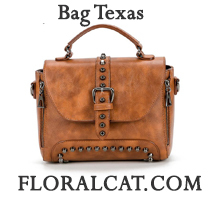 IN this case tour thread is folded in half and a needle is placed on each end You then weave the beads as shown crossing back through to the other side. It’s called a 2 needle right angle weave. You’ll see at the end of the top diagram the needles are left open but in the second diagram at the right you are shown a loop ( now a completed end). What that top right diagram is indicating to you is ” continue to weave the same pattern until it is the length you want it to be”. 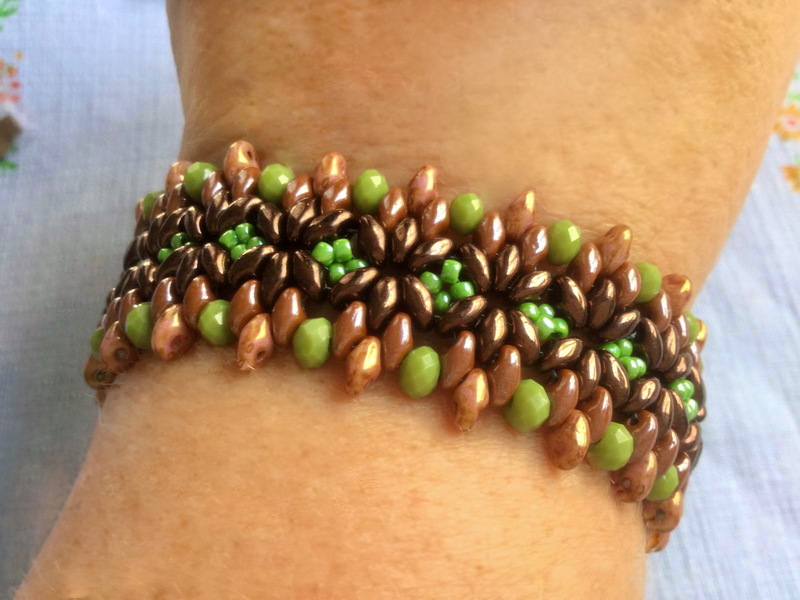 You use whatever beading thread you prefer according to the type of bead you Use. My usual is 8 lb fire line or wildfire. I hope that helps. Ok but how do you get back to the beginning to start the second row after you have finished the base row of two needle right angle weave? I understand the thread is folded in half but that gets you to the end of the base row, where I have been weaving until I have reached my desired length. How do I come back to start the second row? Do I add more thread? How long is the thread in the first place? Do I loop back with the second row and then loop around again to weave on the last row? I like to use Wildfire thread 6 pound. I tend to pull very tightly when weaving and I have actually broken the Fireline during beading. I love the two needle version go right angle weaving over the single needle version, to me the two needles weave up faster. Thanks for all your help. Maybe I am just not smart enough to see this pattern and to replicate it on my own, but I have been beading for more tha 10 years. I really like this site and have made some jewellery from here.